Property Description: Buy Plot No 35 and Get Plot No 36 Free in Dholera Smart City Phase 2, which has total 5780.70 Sq Ft area. These Plots are corner plots on 12 meter wide main road of society. It is a 131 plots society that we are developing. We provide boundary wall with an attractive entrance gate. Dholera Smart City Phase 2 is one of the best projects for residential plots in Dholera SIR by prominent real estate brand Smart Homes. 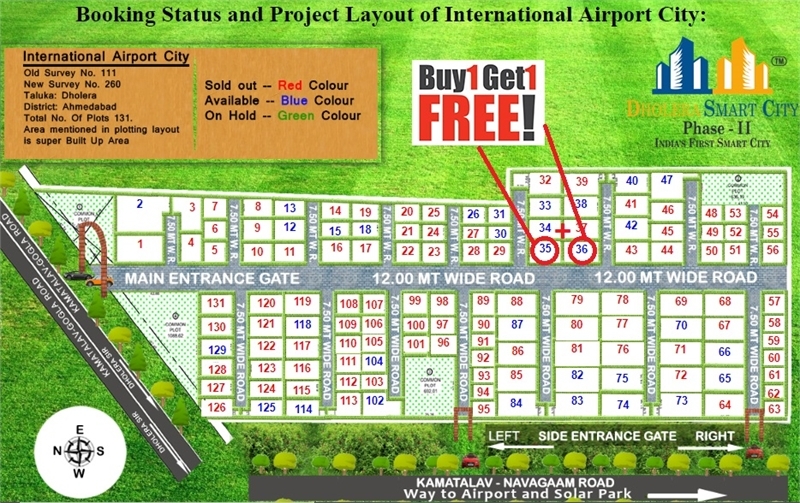 It presents International Airport City closest to the Dholera International Airport zone and Solar Park Zone. 100% legal project, Government approved with complete documents. Booking Amount: Rs. 5,000/-. Rate: per Sq Feet Rs. 555 or per sq yard Rs. 4,999. Easy EMI Available.